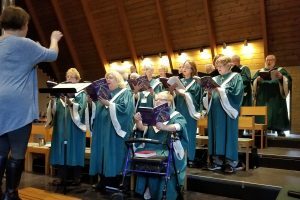 St. Stephen’s Sanctuary Choir sings weekly at the 9:00 service, and rehearses on Wednesday evenings from 7:00-8:30 between September and May. There are no auditions or pre-requisites for joining the Sanctuary Choir, and it is open to all singers of confirmation age and up. The SATB choir also participates in special worship services during Lent, Advent/Christmas, as well as for occasional concerts, funerals, and other musical outreach efforts on behalf of the congregation. Did you miss the Ecumenical Thanksgiving service on November 19? Take a listen to the fantastic job the Festival Choir and Jazz Band (JJs) did with the anthem, "Lift Every Voice and Sing!"